I also have a question: would it be possible to italicise 'Search programs and files', like it was in Windows 7? I'm going to assume you're only one which uses this. Considering it's faster than right clicking, and also that dragging would be the preferred method for touchscreen/tablet users, I'm going to assume you're wrong on this. Latest patch fixed it, nice work! Thank you for the new update! Earlier today I was experimenting with ways to get a reflectionmap on the Startisback taskbar, and found a solution that worked quite well: I opened a transparent reflectionmap that someone posted at another forum with Image Eye (a borderless image viewer that supports transparency), and then positioned it underneath the Windows taskbar. I've added a screenshot of the effect below. I was wondering if such a solution could be integrated into Startisback. Yes, now if explorer is restarted more often than once per 30 seconds, an advice to disable StartIsBack is shown. And for the black screen while explorer.exe is restarted ? Normal ? Please include this new french translation, The current version is not complete. 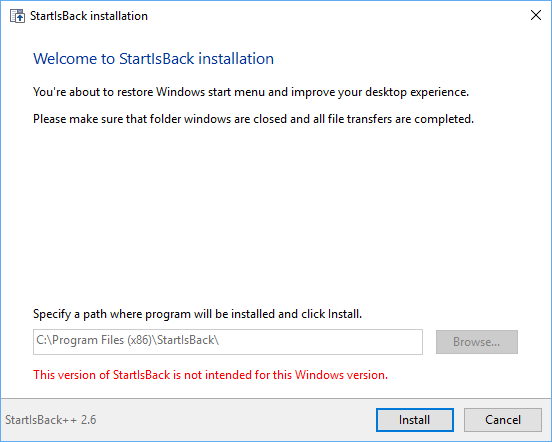 Just updated to 17093.1000 last night, can't get StartisBack to work, any versions work yet?